The trailer terminal tractor is designed specifically to be used at ports, container terminals, distribution and logistics centres, and industrial sites. Terminal tractors work effectively and efficiently, possess fast turnaround time, low operating cost, excellent manoeuvrability, high reliability, and offer unique comfort and easily accessible service points. Stringent environment legislation has prompted terminal tractor manufacturers to develop more refined diesel engines. Furthermore, development of the electric terminal tractor is a major factor that is likely to drive the trailer terminal tractor market during the forecast period. Infrastructure development, adoption of trailer terminal tractor in warehouse management, and increasing use of trailer terminal tractor in the metal industry are likely to offer significant opportunities to the trailer terminal tractor market during the forecast period. The top 20 major global sea ports handled approximately 9.3 billion tons of cargo in 2017, as compared to 8.9 billion tons handled in 2016. Furthermore, according to the UNCTAD (United Nations Conference on Trade and Development), nearly 752.2 million TEUs (20-foot equivalent unit) moved at container ports across the world in 2017, which indicates an increase in sea port activities. Increased cargo handling coupled with economic growth across the globe, upcoming infrastructure development plans, and growth of the global economy are key factors that are anticipated to fuel sea port activities, which in turn is likely to drive the trailer terminal tractor market during the forecast period. Advancements in the trailer terminal tractor, such as liquefied natural gas (LNG) powered terminal tractors, electric terminal tractors, and autonomous terminal tractors that comply with carbon emission regulations, are projected to propel the trailer terminal tractor market during the forecast period. The global trailer terminal tractor market has been segmented based on by fuel, tonnage, axle, end-use industry, technology, and region. Stringent emission norms have led to the development of electric trailer terminal tractor and the LNG powered engine. Governments across the globe are enacting stringent emission norms in order to reduce vehicle emission at ports and other places. Several manufacturers, such as Kalmar and Terberg, showcased their fully electric terminal tractors in 2018 and hence, the BEV segment is expected to expand exponentially during the forecast period. Rising adoption of technology and automation in order to reduce human error and boost work efficiency is likely to prompt the adoption of autonomous tractors at a significant pace. However, the diesel powered trailer terminal tractor segment held a major share; however, the adoption of electric and LNG fuel based trailer terminal tractors is likely to increase during the forecast period, owing to stringent emission norms by sea port authorities along with emission regulatory bodies. Industries in North America extensively utilize terminal tractors owing to the presence of a prominent logistics industry in the region. However, port is the leading segment of the market in all regions across the globe. The above 100 tons segment is expanding at a sluggish pace owing to its very high load carrying capacity, which has limited applications. The between 50 to 100 tons segment is expanding a more rapid pace than the other segments, and is likely to hold a notable share of the market by end of the forecast period. Prominent regions considered for the analysis include North America, Europe, Asia Pacific, Middle East & Africa, and Latin America. Regional level breakdown has been conceded out on the basis of vehicle production, adoption rate, GDP, presence of roof manufacturers and society demand. Application of a large number of the trailer terminal tractors in the logistics industry led North America to account for a major share of the market in 2018. Presence of all major manufacturers in the region make terminal tractors highly popular and hence, the adoption of terminal tractors in the region has been rising significantly in the last few years. It is expected to rise during the forecast period. Awareness among industrialists about terminal tractors is a key factor behind the rapid expansion of the trailer terminal tractor market in the region. The rate of adoption of the terminal tractors in North America is rising at a rapid pace, as compared to other regions of the globe. Industries in North America extensively utilize terminal tractors owing to the presence of a prominent logistics industry in the region. Key companies present in the global trailer terminal tractor market are anticipated to gain benefit from new product development with other global players involved in the development of trailer terminal tractor. Major players operating in the global trailer terminal tractor market include AB Volvo, AUTOCAR, LLC., BYD Company Limited, CAPACITY TRUCKS, CARGOTEC (Kalmar), CVS FERRARI S.P.A., Hoist Liftruck Mfg., LLC, Konecranes, MAFI Transport Systems GmbH, Mol CY nv, Orange EV, SINOTRUK (HONG KONG) LIMITED, TERBERG SPECIAL VEHICLES, and TICO TRACTORS. 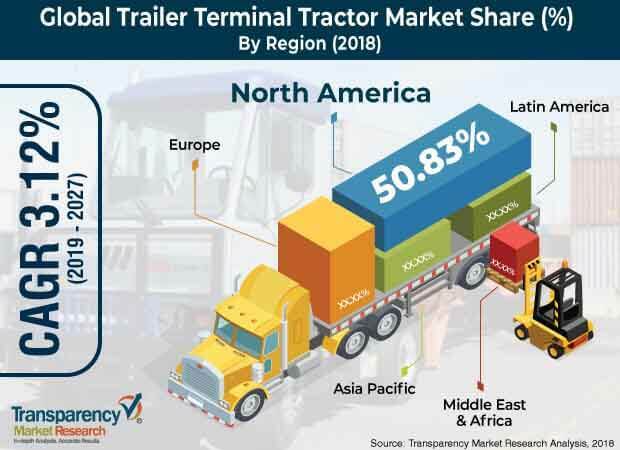 The report comprises a detailed price trend analysis, government regulatory scenarios, value chain analysis, which provides a comprehensive view of the global trailer terminal tractor market. The Porter’s Five Forces model for the trailer terminal tractor market has also been included to help understand the competitive landscape in the market. The study encompasses market attractiveness analysis, wherein end-users are benchmarked based on their market size, growth rate, and general attractiveness. The study provides a decisive view of the global trailer terminal tractor market, by segmenting it in terms of fuel, by tonnage, by axle, by technology, end-use industry and region. These segments have been analyzed based on present and future trends. Regional segmentation includes the current and forecast demand for trailer terminal tractor in North America, Europe, Asia Pacific, Latin America, and Middle East & Africa. The report also covers demand for individual type segments in all the regions. The study includes company profiles of major players operating in the global market. Key players in the trailer terminal tractor market include AB Volvo, AUTOCAR, LLC., BYD Company Limited, CAPACITY TRUCKS, CARGOTEC (Kalmar), CVS FERRARI S.P.A., Hoist Liftruck Mfg., LLC, Konecranes, MAFI Transport Systems GmbH, Mol CY nv, Orange EV, SINOTRUK (HONG KONG) LIMITED, TERBERG SPECIAL VEHICLES, and TICO TRACTORS. Market players have been profiled in terms of attributes such as competitive landscape, company footprint, company overview, financial overview, business strategies, and recent developments. The market for trailer terminal tractor is primarily driven by the rise in development of seaports. The report provides the estimated market size of trailer terminal tractor for 2018 and forecast for the next nine years. The global market size of trailer terminal tractor has been provided in terms of revenue and volume. Market numbers have been estimated based on fuel, tonnage, axle, technology, end-use industry, and regional segments of the trailer terminal tractor market. Market size and forecast for each major type have been provided in terms of global and regional/country markets. Secondary research sources that are typically referred to include, but are not limited to, company websites, annual reports, financial reports, broker reports, investor presentations, and, internal and external proprietary databases, and relevant patent and regulatory databases, national government documents, statistical databases, and market reports, news articles, press releases, and webcasts specific to companies operating in the market, National government documents, statistical databases, and market reports, IMO, European Union, UITP, TTMA, ATA, NTTC, ANSI, CTEA, CTRMC, CVSA, MARKLINES and others.